Thanks to the efforts of our donors and volunteers, Greater Lansing Food Bank works to make sure our neighbors have enough to eat. As the regions’ food bank hub, we supply food pantries, churches, community kitchens and more. As an equal opportunity provider, we respect each individual’s dignity and basic rights. In order to get help now, please use one of the resources listed below. The easiest way to locate your nearest Emergency Food Resources is to dial 2-1-1 on a telephone. This will connect you to a United Way 2-1-1 call center location. The operator will ask you a few basic questions (family size, location, etc.) and provide you with the nearest food distribution location. Individuals and families in Clinton, Eaton, Ingham and Shiawassee will connect to Central Michigan 2-1-1 by dialing 2-1-1 (or use their toll free phone number: 866-561-2500). Those who reside in Gratiot, Isabella and Clare counties should contact Northeast Michigan 2-1-1 by dialing 2-1-1 from a phone (or use their toll free phone number: 888-636-4211). Contact the Michigan Department of Health and Human Services for information on food assistance programs, such as Women, Infants and Children (WIC) and Supplemental Nutrition Assistance Program (SNAP). A statewide map is available where you can click on your county for local contact information. 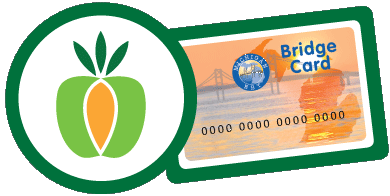 If you are a SNAP Bridge Card recipient, you may be eligible to use your benefits at your local farmers’ market. Participating markets will have an information booth where you can redeem SNAP dollars. For every $1 you redeem, they will give you a bonus $1 (up to $20) to spend on Michigan fruits and vegetables. Grocery stores are beginning to roll out participation too. Redeeming Double Up Food Bucks varies by retailer, so be sure to ask your grocer. For more information check out the Double Up Food Bucks website.